We have seen the Defect life cycle and how can we post the bug while doing testing procedure for our application. 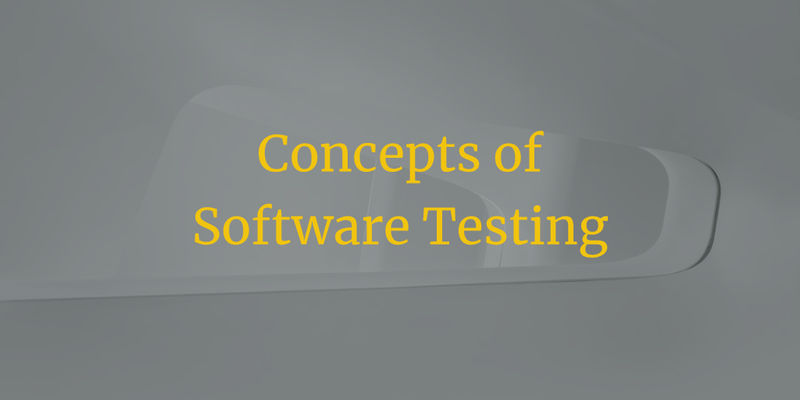 Now In this article we will understand the concepts of software testing. There are some concepts and theories are define for effective software testing. Below are the description of same. 1. Existence of Bugs in application: Software testing will give the surety about the presence of bugs in Software or applications but same side it can’t give 100% surety that any software is bug free event after completing the all round of testing and all posted issues have been resolved. Testing will give reduce the number of defects and effectivity for same but correctness of bugs can’t be verified by software testing. 2. Condition Based Testing: Sometimes we have to apply some conditions on application to verify the results and testing procedures but same way we can say that all condition cannot be applied to the application for generating the expected outputs. For example, we will have 13 field on our screen so we can’t verify each fields with 5 to 6 different values. It will take so much time to validate the fields. In this situations we need to take calculative risks for our application and we can give priorities to the important fields. If any filed will be used for integration then we must give more values to them instead of normal fields and According to severity and priority should be decided by testers for the applications. Risk needs to be taken as Product risk and Project Risk. If any function which is not that much in use then we can skip testing or we can provide less time to that function but If any function which have high priority and expected result is the main agenda then this function should not be skipped neither it must not be taken lightly by testing team. Each possible scenarios and condition should be performed for this kind of Functions. 3. Early Testing Approach: This Approach we have already learnt in Software development life cycle. As we have seen in this, early testing will help us to find out the defects in early stage. Thus, it helps to produce the effective Product. Most of the critical issues have been solved in early stages so further any integration issues will not be disturb the application or product on the week of delivery. It helps to reduce the risk of critical defects on final release. If early testing concept will not be implemented then it may happen that important functionality or important section of the product have been left till the last date and afterwards due to time limit we have to deliver it with defects which is not good for the client relationship. Thus, the early testing approach is playing major role in software testing. 4. Unit Testing: Here Unit testing is done by developer team. We can say that if In house testing have been done or prerelease testing have been done perfectly then Beta testing will not give much defects on site. Without the help of Design team or QA team, Developer can verify their code and Look and fill as a customer, this can be called Unit testing or Alpha Testing. They can do debugging procedure and find the bugs easily which help us to serve better to our customers. 5. Duplicate Testing: If same type of bugs can be posted again and again then major functionality of the application will left. To overcome this kind of duplicate testing we need to verify our test case report in daily basis. Duplicate defects should not be posted by testers again and again. All the Functions and Part of the application needs to be covered in testing phase. 6. Requirement of Testing: Same Steps for Testing will not be implemented for each project or sites. Each Application will have their own requirements to test. Testing steps and condition will not be same for each project. It must be changed as per the domain requirements. For example, we need to apply different steps to verify e-commerce web site and CRM Applications. 7. Garbage Errors: Some errors in application will not reproduced again or we can say that some defects are not in requirements of client. If this kind of defects will not solved by the developer team then release will not be stopped as this kind of garbage error will not disturb the application.